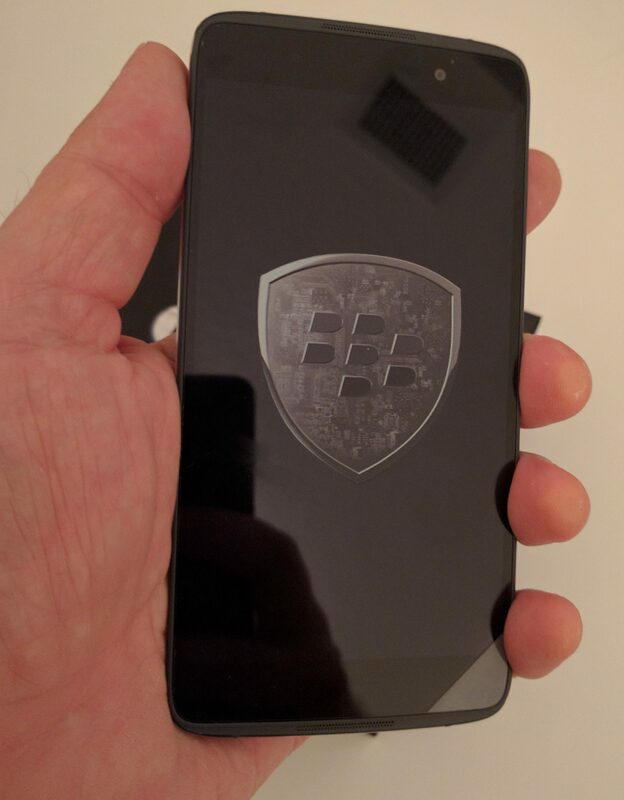 I got my hands on a new BlackBerry DTEK 50 yesterday. I have to confess, I was really looking forward to this. I’d had a Priv earlier and in a fit of generosity, gave it to one of our writers who had lost his phone. I then took the opportunity to try out the Samsung Galaxy 6 and the Google’s Nexus 6P. The Galaxy went to another staff member who needed a great camera on a phone. That was okay with me; I could never get used to the curved touch screen, which always seemed to be difficult with my large fingers around that curve area. The Nexus was just plain frustrating — slow and battery draining. And its lack of BlackBerry Hub and some other key features made the unpacking of the DTEK50 a special occasion for me. I thought I’d share it with our readers. 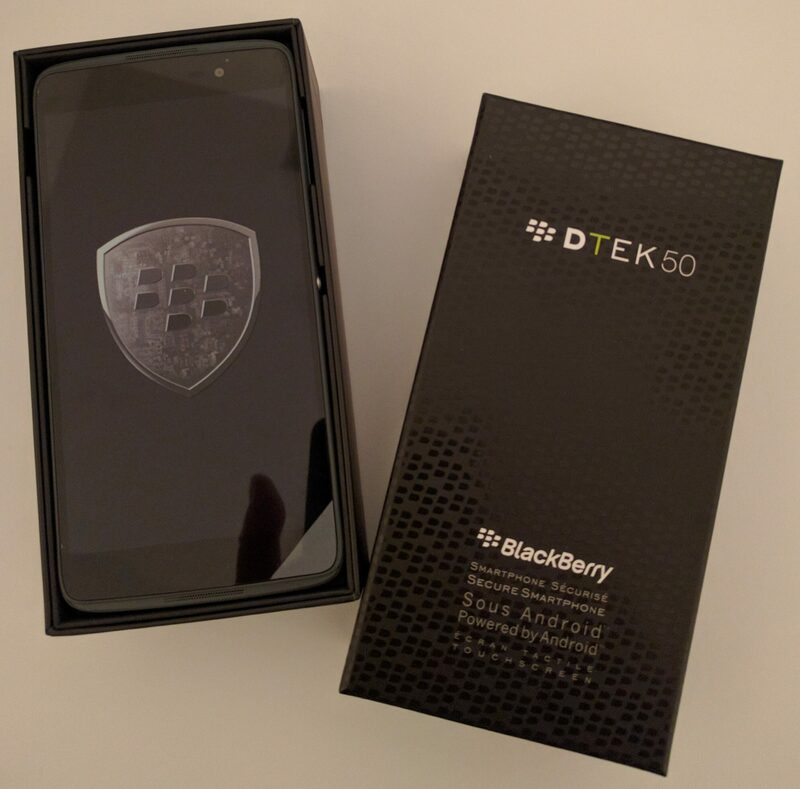 The DTEK50 is the latest in the line of BlackBerry Android phones. What makes it different from other BlackBerry offerings? Right out of the box — the big news is the price. BlackBerry expects this phone to retail at $429 versus $800 for its first Android offering — the BlackBerry Priv. At this price, BlackBerry is hoping to get a “broad take-up” in their target market of “small and medium-sized enterprises as well as consumers who believe in privacy and security,” according to Alex Thurber, senior vice-president of global device sales for BlackBerry. Where do they get these names? A friend asked me that last night in a bar as I showed him the new phone. I explained what is obvious to those who follow BlackBerry. DTEK50 is named after the easy to use security monitor and coaching software that BlackBerry first released on the Priv. DTEK is a mashup of the word “detection” which is what the DTEK50 software does. The first thing that you notice is the lack of the iconic BlackBerry keyboard. I asked Thurber about being nervous about testing this new phone — you don’t want to be the one who loses it in a bar. Thurber noted that he wasn’t that worried, “at first glance it looks like just another Android phone.” And he’s right – it does. But Thurber also noted that “iconic physical keyboard” will be back in a future version. We tried to trick him into giving us the name. He wouldn’t. But we did find out that the next phone with a physical keyboard will be released in this fiscal year. 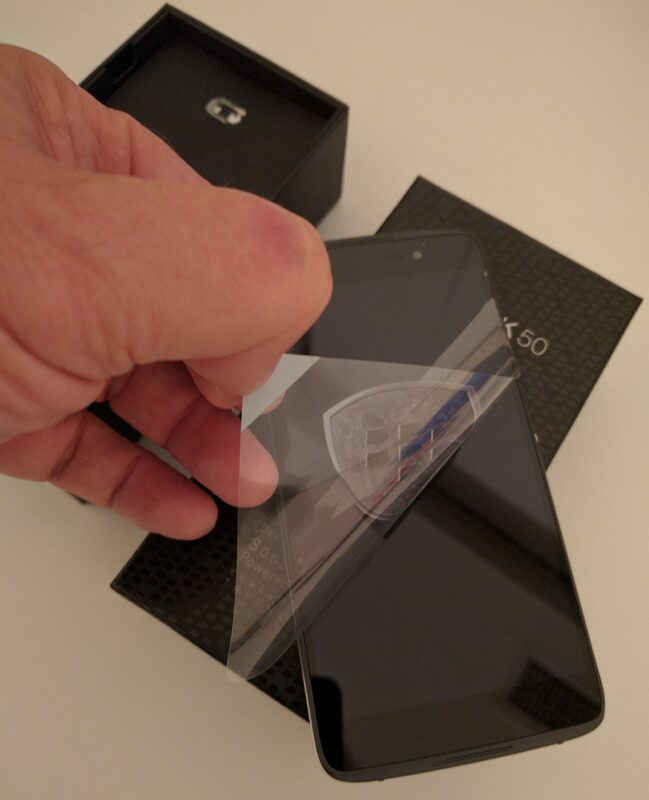 Okay, call me a geek but I love to peel the plastic off the screen on a new device. It’s exciting to be among the first to try these. BlackBerry has to be hoping that others will feel the same way. John Chen, BlackBerry’s CEO, has stated that if handsets don’t become profitable, BlackBerry will get out of that business. The phone will appear with the three main Canadian carriers and BlackBerry is happy to continue that partnership. “We have a great relationship with the three Canadian carriers,” said Thurber, “and with other carriers around the world.” But that won’t be the only way you get to peel back the plastic. But that won’t be the only way you get to peel back the plastic. The go-to-market strategy for BlackBerry is going to be different. BlackBerry is looking to expand into the channel, using value-added resellers (VARs). Can it really do this? Actually, it’s not that far-fetched. BlackBerry is already on its way to being a true software company and not just a handset manufacturer. It has an exceptional enterprise mobility management solution with BES that can manage all mobile devices — not just those from BlackBerry. It has acquired an impressive list of software products from WatchDocs to AtHoc that enhance and manage secure mobile collaboration. Add that to its security message and you can imagine a VAR looking at a services offering featuring a secure mobile solution with a related BlackBerry offering. It’s not a slam-dunk, but it’s as good or better than some of the channel strategies of some of the other large players. You can’t help but notice the missing fingerprint scanner. 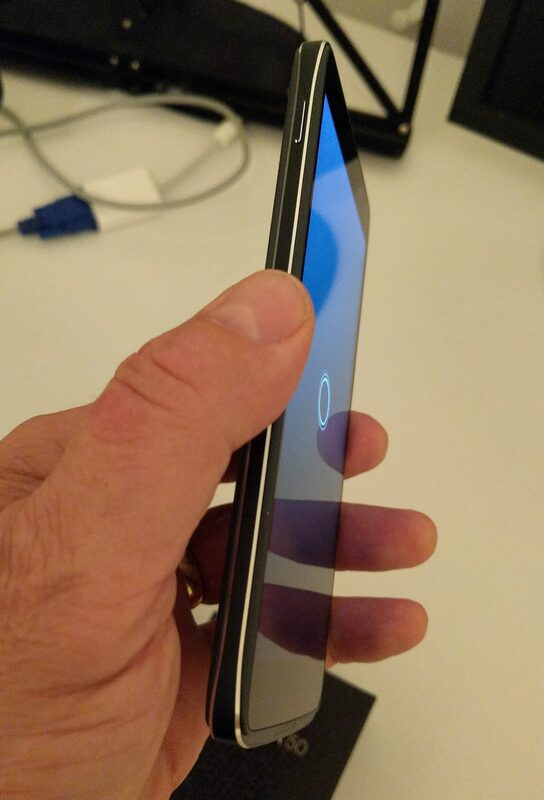 It’s not on the front where the Priv had it and it’s not on the back where Google has conveniently located it for its Nexus model Android phones. What else did they have to do to get to the new price point? For that you have to dig into the specs. They’re on paper. Isn’t that cute? The screen real estate is smaller than the PRIV. The PRIV has a 5.4” screen. 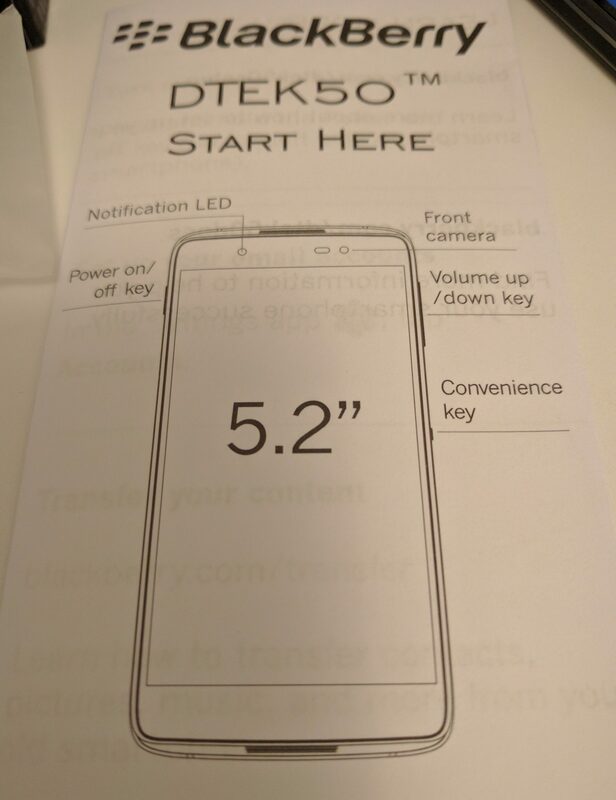 DTEK50 has a slightly but noticibly smaller screen and footprint a 5.2”. But the touch screen is crisp and clear and so far, very responsive even for me and I’ve had some issues with other Android phones. Both the PRIV and the DTEK50 are using the Snapdragon processor with 3GB of RAM. In my first usage, both seemed to have a very peppy feel to them, but we’ll find out whether the DTEK processor has the same speed as the PRIV as I load it down and use it. The primary camera dropped from 18 megapixels (MP) on the PRIV to 13 on the DTEK50. I couldn’t notice any immediate difference in the pictures I was taking, but I’ll be giving that a closer look. The PRIV had a beautiful camera and it’s video capabilities were first rate. I did remote HD video for stories on the PRIV. We’ll see how well the DTEK50 does as I use it. The front or “selfie” camera on the PRIV was 2 MP and if I read it right the DTEK has taken that up to 8 MP. I’ve taken one selfie in my life but I do use video conferencing a lot so this is of some interest. The battery specs are different but since I don’t have a degree in physics, I can’t tell you what the difference between the Li-Ion 3410 milliamp (mAh) battery in the PRIV and the 2610 mAh batter in the DTEK50 really means in real life use. I had off and on challenges with the PRIV in terms of battery life but nothing like what I went through with the Galaxy and Nexus. We’ll find out in real life usage. 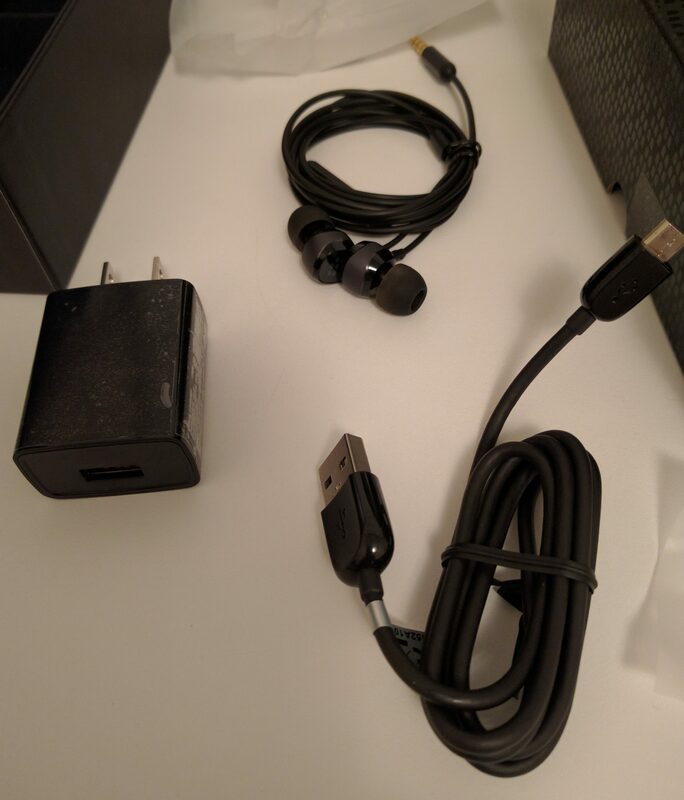 But more important to me, both DTEK and PRIV support BlackBerry’s Quick Charge 2.0 feature. The PRIV can get to 60% battery in 30 minutes. The DTEK50 advertises a more modest 50 per cent charge in 51 minutes. Again, what this means in real life, I’ll have to test. The new headphones are very BlackBerry but I am prejudiced. I’ve never gotten used to those weird shapes on the Apple headphones and BlackBerry has always delivered a comfortable headphone that actually stays in my ears when I’m walking. Last but certainly not least, the DTEK50 has kept the expandable memory. The DTEK50 ships with 16GB of RAM but if you need more you can expand up to 2TB with a relatively cheap aftermarket SD card. My Nexus wouldn’t let me do this at all. My wife’s iPhone doesn’t either. The solution in both of these cases? Buy a more expensive model when you find out that you really do have a huge amount of data or try to store it in the cloud and exhaust your data plan quickly. For a budget-conscious consumer who wants to carry a load of data on their phone and work (or listen) anywhere, this is real plus. An End to Dropped Calls? One of the things that drove me crazy on other Android phones was the where they put the power buttons right where your hand goes when you pick up your phone. I have dropped dozens of calls this way which when you are in your car supposedly hands-free is a pain. BlackBerry put the power button where it should be — out of reach when holding the phone but easy to get to when you need it. On the right side of the phone is a programmable button which is small and doesn’t get hit easily when you pick up the phone. You can program that for whatever you like – or if you are clumsy like me – program it to do nothing. 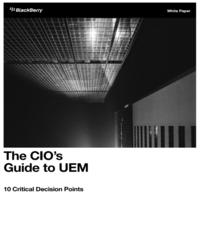 Seriously, though – these are minor points but they are important. It is after all, a mobile phone, and it should make that easy. And the device has kept many of the great features that made the Priv a real productivity-boosting device. For instance, the BlackBerry Hub puts all of your accounts into one easy to manage bundle. This is a place where BlackBerry excels but doesn’t get enough credit. Doing simple things like signing onto a conference call from your calendar are incredibly easy on BlackBerry. For example, if you’ve ever had to pull over the car to write down and then dial a long sequence of numbers to get on a conference call you will really, really appreciate the genius at BlackBerry that decided to find that number for you even and insert it even when it wasn’t in a predictable location. After all, mobile devices are supposed to make you more efficient. Another thing that BlackBerry has always done well — setup. I have four Gmail accounts, a lot of apps, a tonne of music, and I transferred it all last night before I went to bed. The Near Field Communication (NFC) function where you put the two phones back to back and wait for them to hook up didn’t work, but I sort of expected that. I’ve had real issues with file transfers with my Nexus – it’s never worked reliably and I resented the fact that I had to put the Nexus into an unsafe developer mode to be able to exchange files between my laptop and the phone. 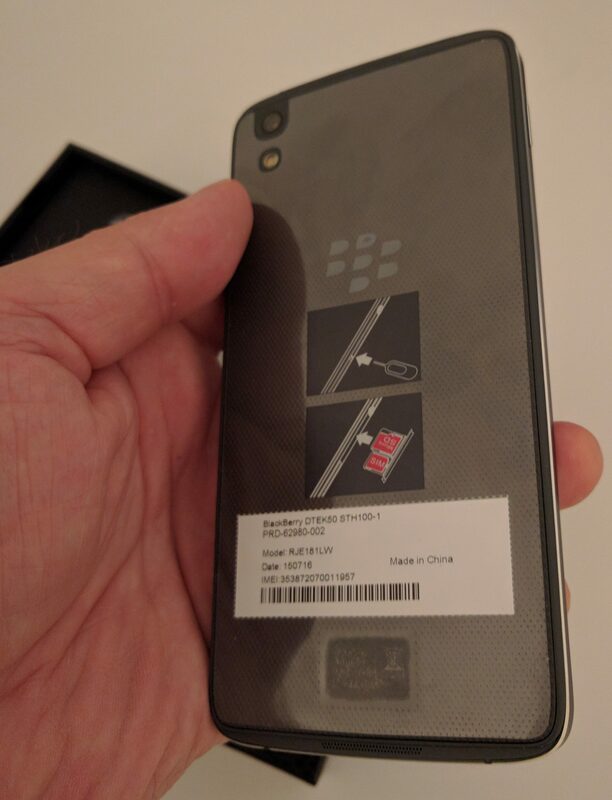 The fact that NFC didn’t work could have been frustrating but someone at BlackBerry hasthought this through. 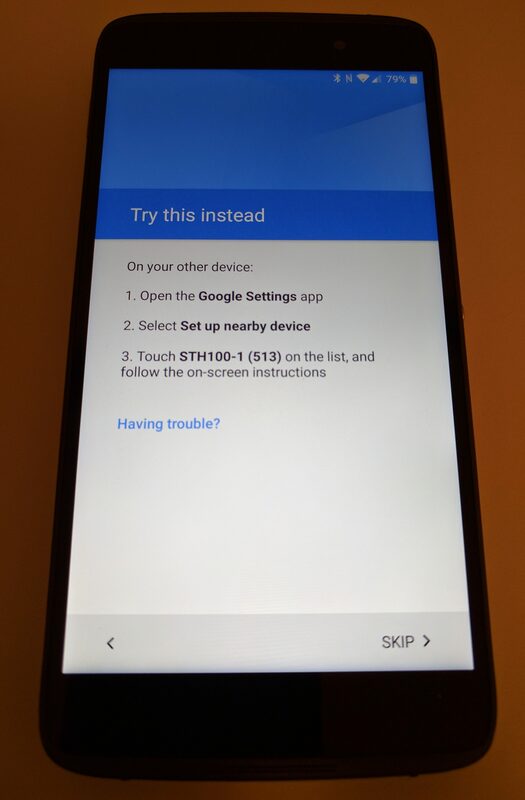 I went to an option titled “try another way” and it gave me manual instructions. The only trouble I had was finding the “Google Settings” app. It is (counter-intuitively) not in the Google app folders. Nor is it “Settings” on your Google Accounts. Nope. Go to Settings for the phone and then look for Google Settings. Once I got that, I followed the instructions and it worked. BlackBerry got a lot right with the new DTEK50. The price point is excellent and the cost of ownership in terms of peripherals adds to the cost savings in a meaningful way. For their intended customer base of SME’s and security conscious consumers this matters. In terms of usability, as I noted, BlackBerry doesn’t get enough credit for the ergonomics and practicality of their hardware and software. Only BlackBerry fans really seem to appreciate some fo the features which really do make setup and operation easy and enhance productivity. Even for the sophisticated road warrior, this phone has a lot going for it. It’s elegant and light. It’s responsive and has great productivity features. And it’s secure – for those of us carrying valuable data on our phones, that matters. If they can get that message through to a budget conscious SME user, John Chen may have two successes to his credit — the transformation of BlackBerry into a serious enterprise software firm and the resurrection of the handset, perhaps not to its past glory, but at least to a respectable niche offering. Time will tell. Good first impression on this one. I’ll be checking it out over the next few days. I've been in IT and business for over 30 years. I worked my way up, literally from the mail room and I've done every job from mail clerk to CEO. Today I'm CIO and Chief Digital Officer of IT World Canada - Canada's leader in ICT publishing and digital marketing.